George Graham Reviews The McDades' "Bloom"
Celtic music is at least as strong in Canada as it is in the US, with a good number of bands and artists from the country having an impact on the international scene. April Verch and Searson are a couple of the more popular. This week we have CD by another excellent group, this one not from the Atlantic coastal regions of Canada where many such groups have originated, but from Edmonton, Alberta. And like Searson, they are a mostly family band. They bear the self-explanatory name the McDades, and their new CD, their second, is called Bloom. The McDades are two brothers, Solon and Jeremiah, and a sister Shannon Johnson, who are joined by two unrelated colleagues, guitarist Andy Hillhouse, and François Taillefer a world-travelling percussionist who specializes in hand percussion. Shannon plays fiddle and sings, Solon plays acoustic bass and sings, and Jeremiah plays all manner of wind-instruments, including penny whistle, Irish flute, and a jazzy-sounding soprano saxophone. Their music is wide-ranging, though it remains acoustic. While their major influence is Celtic, like many others in the increasingly eclectic scene, they draw on varieties of world music, including some Middle Eastern sounds. Taillefer's hand drums can often sound Middle Eastern, and interestingly, he is not often heard on the standard Irish hand drum, the bodhrán. The band has excellent sibling vocal harmonies, but a lot of this recording is instrumental. And they do use the opportunity to show off their outstanding musicianship -- not overly flashy, but tight, and often showing creative, sometimes unexpected arrangements. The group are also known for their jazzy improvisations in performance. The material they draw on runs from original instrumentals to a song by 1960s folk luminary Ian Tyson. And there is a share of traditional music, including some in French. It's a very appealing mix of influences and sounds that often has an infectious rhythm. Bloom, the new CD by the Canadian group The McDades is fine example of eclectic Celtic-based music that is far from traditional but still manages to keep the sound and spirit of the music while incorporating lots of other influences from hither and yon. The level of musicianship in the band is very impressive, in terms of their virtuosity, their tastefulness, their delight in combining influences and instrumental sounds, and they have great vocals when they choose to sing. With their distinctive combination of instruments and influences, they have already established a trademark sound. For an audio quality grade, we'll give the CD an A-minus. There is good clarity and the mix captures everything well. The only quibble is our usual one: the dynamic range, the span from loud to soft, is somewhat compressed, as is the case for most CDs these days. But that still does not make it a desirable thing for acoustic music. The McDades defy a couple of stereotypes. There is certainly cohesion in a band dominated by siblings, but it usually tends to take the form of vocal harmonies. 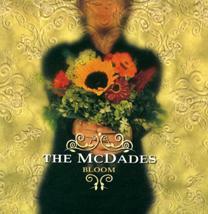 Though the McDades do their share of vocals, a fair portion of their music is instrumental. But the literal kinship does translate into a strong musical bond. The other is that most Canadian Celtic music comes from the Maritimes. These folks from Edmonton, 300 miles north of Montana, show that that isn't true. All in all, it's an outstanding recording that takes Celtic influenced music to some pleasing new places. (c) Copyright 2007 George D. Graham. All rights reseved.